India Yamaha Motor Pvt. Ltd. has introduced the Stylish Macho Street Fighter - Yamaha FZ-S. 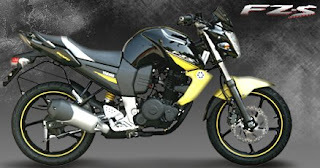 The FZ-S will be offered in two colours - Yellow Streak and Silver Tech. The bike will be priced at Rs. 67,000. Both the colours are trendsetters, being cool, magnetic and hip-hop. The colours give the FZ-S the X-factor which enhances the fashion statement of the rider. FZ-S highlights the style quotient and has more flesh to flaunt with purely European international design like new colours & graphics, aerodynamic chiselled windshield, stylish & sporty carbon pattern meter consol, and more aggressive looking headlight. The new FZ-S is for stylish and attention seeking Macho man. well wid sum some extra featues,bike is on d road n attracting d huge crowd...according to yamaha officials bike is made with the Triple Macho concept projecting the Muscular silhouette, muscular body parts and muscular chassis, FZ -S is an object de’art on the street and reflects visual expression of performance.